American musical critic and editor; born at Baltimore, Md., May 21, 1851; educated in the public schools of that city, and later at the College of Loyola. 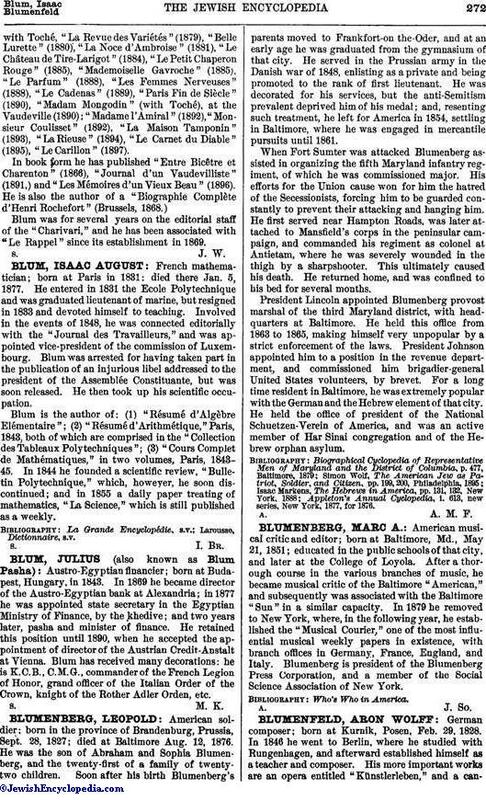 After a thorough course in the various branches of music, he became musical critic of the Baltimore "American," and subsequently was associated with the Baltimore "Sun" in a similar capacity. In 1879 he removed to New York, where, in the following year, he established the "Musical Courier," one of the most influential musical weekly papers in existence, with branch offices in Germany, France, England, and Italy. Blumenberg is president of the Blumenberg Press Corporation, and a member of the Social Science Association of New York.